Allan Bremner, an employee of Hawboldt’s for forty-four years, felt strongly about the need to commemorate the extraordinary ingenuity of Forman Hawboldt. He approached Brad Armstrong, a Hawboldt relative, and the Chester Municipal Heritage Society to see what might be possible. 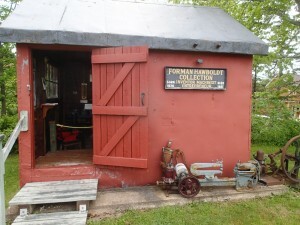 It was decided to build a permanent collection of Hawboldt machinery, equipment and memorabilia using the original village water pump as the focal point. To house the collection the pump house was relocated from the foundry site on North Street across the street to the Chester Train Station on Smith Road. 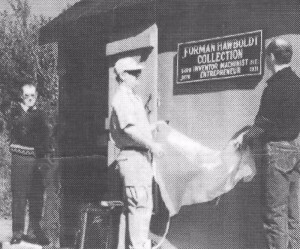 The Official Opening Ceremony for the Forman Hawboldt Exhibit was held on October 1, 1995, with local dignitaries, Hawboldt employees and Chester residents in attendance. The Exhibit is open to the public from June through September each year. Other examples of Hawboldt machinery are on display throughout Nova Scotia, notably a 2-cycle single cylinder engine in the foyer of the Municipal Office on King Street, Chester, the DesBrissay Museum in Bridgewater and the Fisheries Museum of the Atlantic in Lunenburg.